The Panzerkampfwagen 38(t) was originally a Czechoslovak tank of pre-World War II design. After Czechoslovakia was taken over by Germany, it was adopted by the German Army, seeing service in the invasions of Poland, France and the USSR. Production ended in 1942, when its main armament was deemed inadequate. In all, over 1,400 Pz. 38(t)s were manufactured. 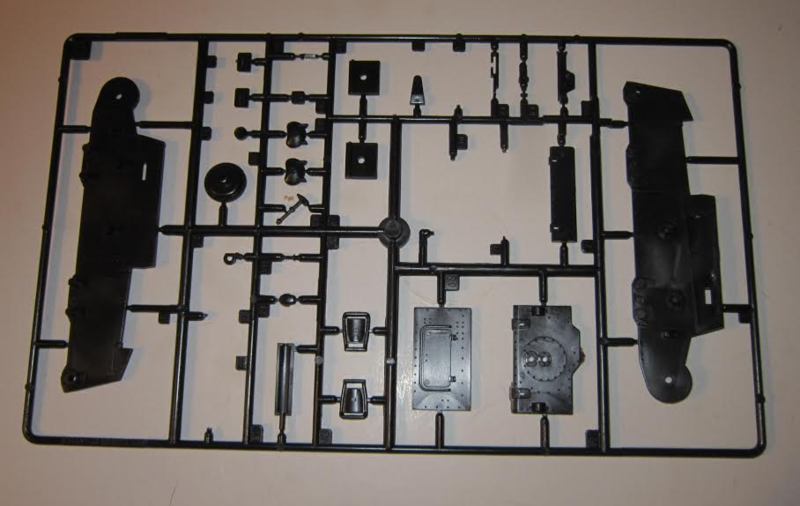 The chassis of the Pz. 38(t) continued to be produced for the Marder III (1942–1944) with some of its components used in the later Jagdpanzer 38 (1944–1945) tank destroyers and its derivative vehicles. The (t) stands for tschechisch, the German word for Czech; the Czechoslovak military designation was LT vz. 38 (Lehký tank vzor 38, Light Tank model 38). 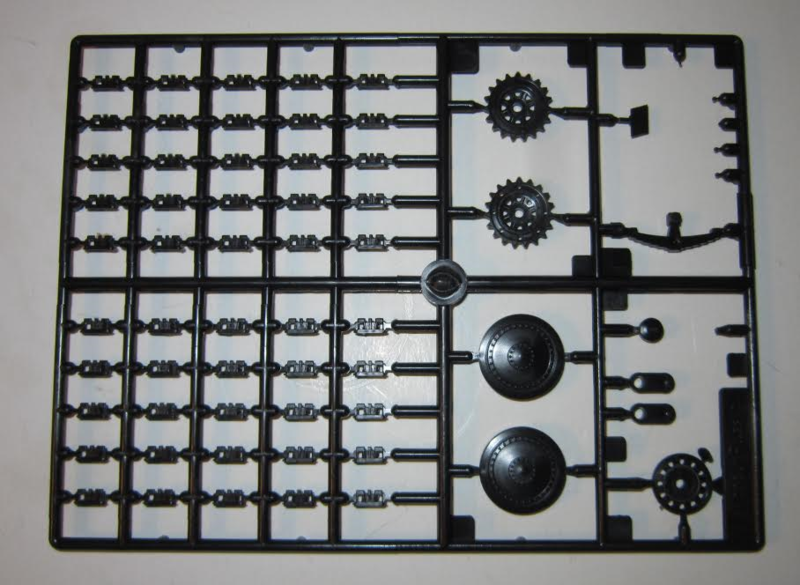 Manufacturer's designations included TNH series, TNHPS, LTP and LTH. The special vehicle designation for the tank in Germany was Sd. Kfz. 140. The Befelswagen (Bfwg.) was a radio equipped command vehicle. Maquette is a model compnay based in Russia. 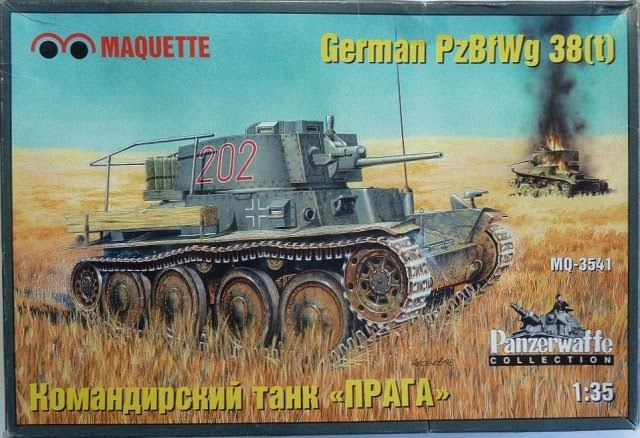 The box art shows a Pz.Bfwg. 38(t) crossing a grassy field. It is overall Panzer-gray with a large red 202 outlined in white on the sides of the turret and a large white German skeletal cross on the sides of the hull. In the background is a burning Soviet T-26 tank. 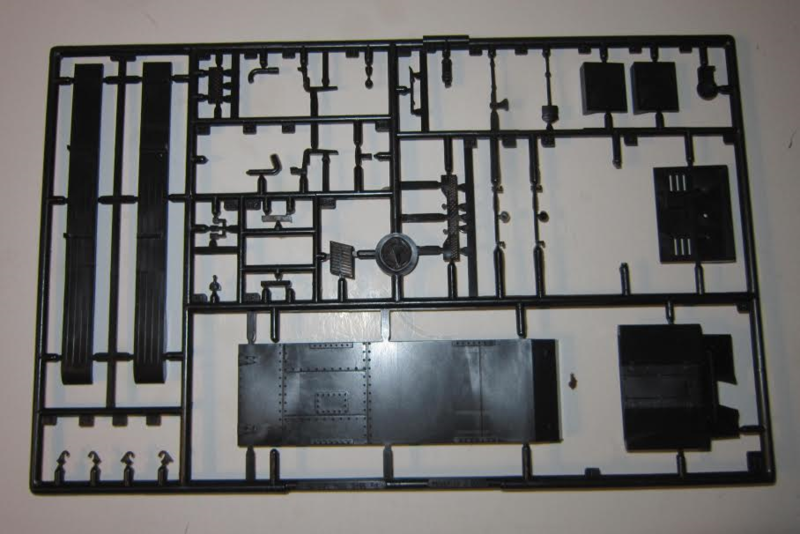 One side panel repeats the box art in color smaller, followed by model kit is suitable for age 10 to adult. Contains decals and assembly instructions. Paint and cement are not included, in Russian and English. The other side panel has color box arts of a Auflarunspanzer 38(t) Sd.Kfz. 140/1, a Pz.Kpfw. 38(t) Ausg. G, a 7.62cm Pak (r) Auf. Pz.Kpfw. 38(t) Marder III, a Pz.Kpfw. 38(t) Ausf. C and a 15cm Sig 33 Auft. Pz.Kpfw. I Ausf. B. No kit numbers are given for these. 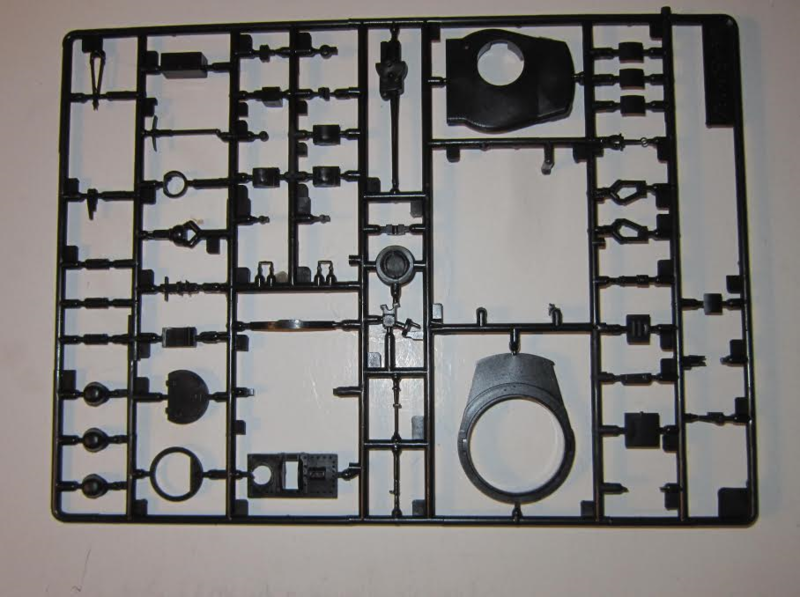 This kit contains 7 jet-black trees and 1 light-gray tree that are not in cello bags, the decal sheet and the instructions. On the bottom of the tray inside is a color box art of Maquette's kit of the Mig-3 Soviet fighter. The instructions consists of 3 loose sheets, printed on both sides to create 6 pages in 8 1/4" x 11 1/2" page format. Page 1 begins with the history of the tank in Russian and English, over painting and marking instructions for the box art scheme as a 3-view. It further shows a small white German skeletal cross on the front and rear of the hull and a white letter C on the right side of the rear. Pages 2 through 6 give a total of 14 assembly steps. 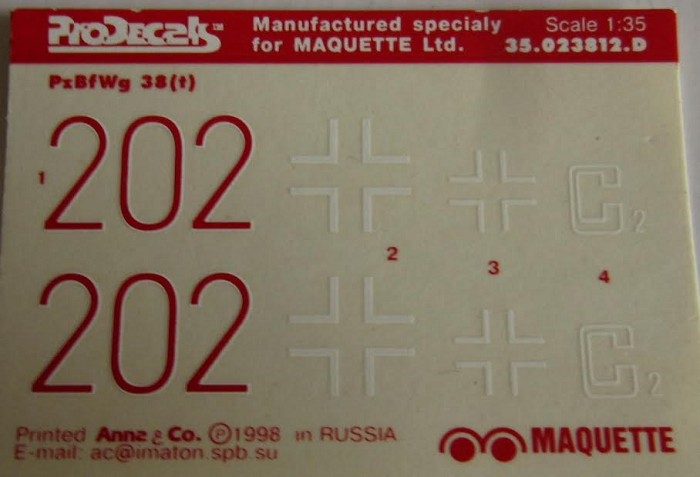 The decal sheet for one version. There are no crew figures or clear parts. Great detail inside and out.